It seems Syfy has given up the ghost. The Ghost Wars TV show on Syfy has been cancelled after one season. Rob Owen, of the Pittsburgh Post-Gazette reports he has confirmed the Ghost Wars cancellation. 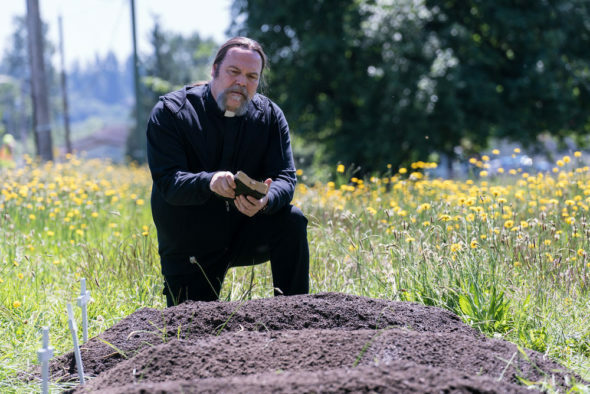 Since there will be no second season, the season one finale episode, “…My Soul to Keep” will also serve as the Ghost Wars TV series finale. A Syfy horror drama, Ghost Wars stars Avan Jogia, Vincent D’Onofrio, Kim Coates, Kandyse McClure, Kristin Lehman, Meat Loaf Aday, Sarah Giles, Allison James, Elise Gatien, and Sonja Bennett. The supernatural saga unfolds in isolated Port Moore, Alaska, which has been overrun by paranormal activity. It centers on local loner Roman Mercer (Jogia), a troubled psychic whose ability to see the dead has been the bane of his existence. The residents of Port Moore tend to look upon Roman as an outcast. In order to rescue them from the mass haunting which could be their undoing, Roman must first conquer their narrow-minded preconceptions, as well as the skeletons in his own closet. 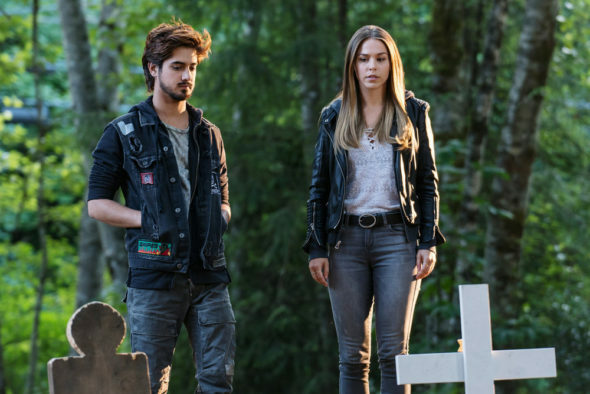 The first season of Ghost Wars averaged a 0.09 rating in the 18-49 demographic and 376,000 viewers. Of the Syfy TV shows we’ve been tracking, those ratings left Ghost Wars ranked 11th out of 14 scripted TV series. In other words, the cancellation is understandable. What do you think? Did you watch the first season of the Ghost Wars TV show? If it were up to you, would Syfy have cancelled or renewed Ghost Wars for a second season? Sound off, in comments below. I would’ve continued watching ghost wars. Once I had the first season. I wanted to keep watching. And then to hear it’s just season 1? I’m really disappointed. It was such a awesome series. It was a bit disgusting, because the special effects, the goo and slime was gross. But we enjoyed watching it. It became my favourite after supernatural. Please guys can you try and uncancel it? I think it didn’t get the chance it needed. Try and do a season 2 and by then if it doesn’t become a hit, throw in the towel. I would have definitely continued watching. Bring Ghost Wars back. Would have like liked to see a second season of this show, but just like with Helix, Syfy seems to cancel it’s shows and leave viewers with more questions than answers and no way to get those answers. Annoying!! I’m sad it’s canceled. Hope Netflix pick it up and make a season 2! I liked the show. I was excited for season 2. Can’t keep a good thing going. Oh that’s right it’s not a reality show. I am very upset about this. I hope Netflix or Hulu picks up season 2. Should not have ended. Great show, Season 2 would be great too! It shouldn’t have ended it had everything people like myself love to watch . I thought and expected a 2nd season which would have been even better .